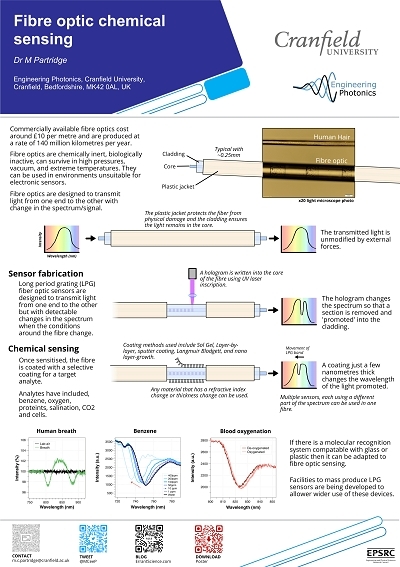 The FLAIR conference, now in its 5th edition, brings together industrial and academic researchers to explore and discuss field laser applications for sensitive and selective detection of molecular species. This edition was held for the first time in the beautiful French mountain resort town of Aix-les-Bains. 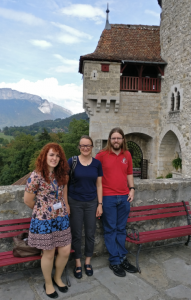 With a particular interest in gas sensing applications, Jane, Sarah and Nick attended, presenting three posters describing their work on both the use of integrating spheres as gas cell and the use of specific lasers for methane detection. 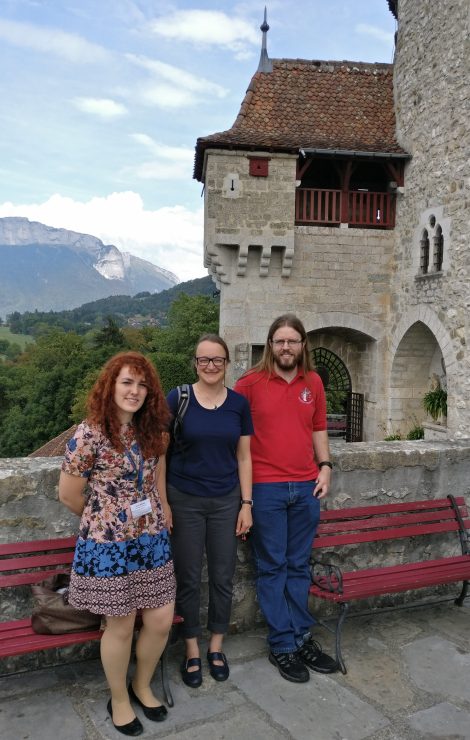 Sarah, Jane, and Nick visiting the Château de Menthon-Saint-Bernard near Annecy during the FLAIR conference. Typically, commercially available laser diodes in the near infrared have to be custom made at a particular wavelength, such as Distributed Feedback (DFB) lasers. This requires significant investment with potentially low yields. 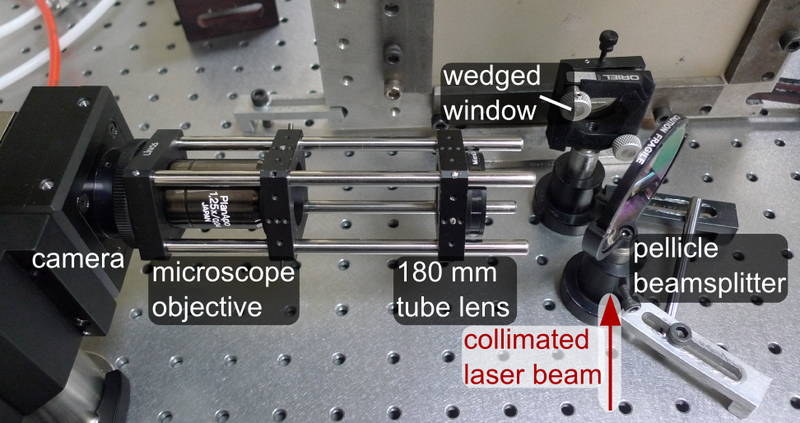 The latest results in the development of a new, external cavity, Bragg stabilised laser for tunable diode laser spectroscopy (TDLS) were presented. The design uses a silicon-on-silicon platform incorporating a UV written Bragg grating as the wavelength selective element of the laser cavity. Thus, custom wavelengths can be written “on demand” with relatively low capital investment. 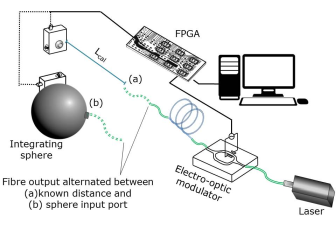 Pathlength calibration presents one of the major challenges for integrating sphere gas cells as the achievable pathlength is a sensitive function of the sphere wall reflectivity. The use of high frequency laser intensity modulation allows for the pathlength to be calculated in real time, and without the requirement for a reference gas cell. Setup used for high frequency laser intensity modulation for integrating sphere pathlength calibration. ICL based TDLS instrument developed for airborne measurements of atmospheric methane. Several platforms are used worldwide for airborne atmospheric monitoring of various gases, based on tunable diode laser spectroscopy (TDLS). For high signal-to-noise ratios multipass optical cells are used, which are difficult to align and increase the problem of optical interference fringes. On aircraft, high levels of vibration and large temperature fluctuations compromise performance compared with laboratory operation. 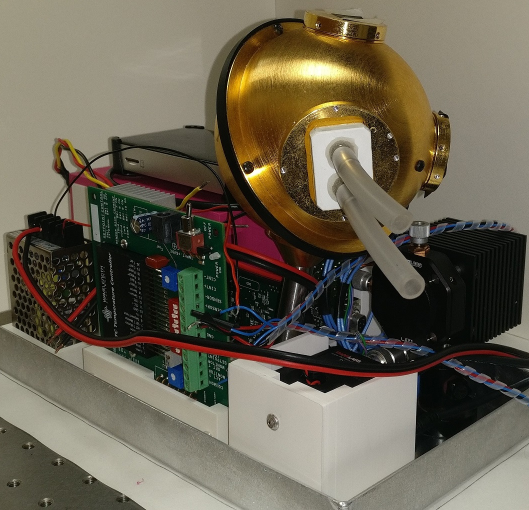 We have developed a gas sensor for use on aircraft using an ICL, allowing for the detection of the fundamental absorption bands of methane at 3.3µm, and an integrating sphere as the gas cell. These cells are easy to align, insensitive to vibration and do not produce interference fringes. 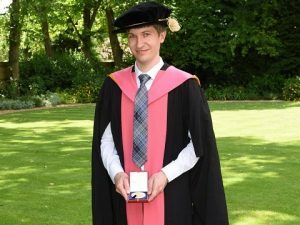 Former Engineering Photonics PhD student Thomas Kissinger, who now works as a research fellow within the group, has won Cranfield Universities’ highest honour for doctoral students, the Lord Kings Norton Medal for his PhD thesis1 entitled “Range-resolved optical interferometric signal processing”. The medal was presented as part of this years’ graduation ceremony on the 8th of July 2016. This medal is awarded annually to the most outstanding doctoral student of the year and is the only prize for which students compete across the two campuses of the University. The award was established in 1978 by our former Chancellor, Lord Kings Norton of Wotton Underwood, who sadly passed away in 1997, aged 95 years. 1. T. Kissinger, "Range-resolved optical interferometric signal processing”, PhD Thesis, Cranfield University (2015). 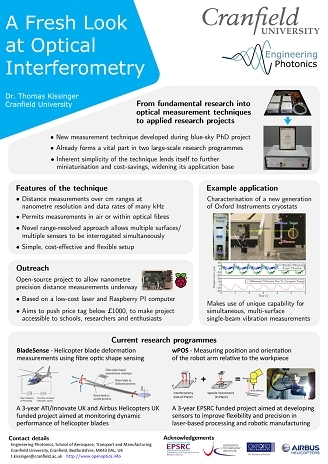 Results from the multi-surface vibrometry system developed at by Engineering Photonics1,2 at Cranfield University were presented by Thomas Kissinger at the 12th International conference on laser vibration measurements held in Ancona, Italy. Figure 1 The conference was held in the historic Muse theatre in the heart of Ancona. Apart from the obvious benefits of good food, nice weather and historic surroundings, see Fig. 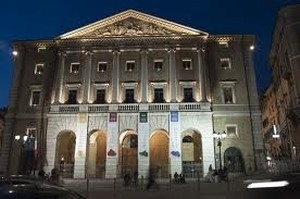 1, the long running Ancona laser vibrometry conference is the premier conference in the field. It is a suitable venue to present our work on multi-surface vibrometry, which allows displacement signals from multiple semi-reflecting surfaces along a single laser beam to be evaluated simultaneously. 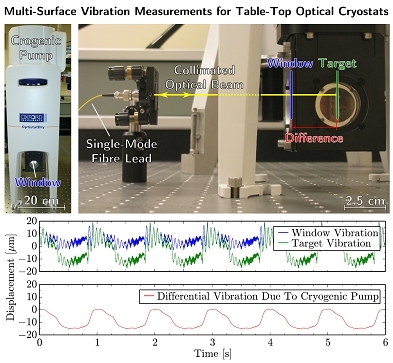 This new technique allowed the concurrent measurement of differential and common-mode vibrations of the cryostat (see Fig. 2) and could also be of use in other situations where differential displacement or vibration measurements are required. Figure 2 Typical measurement results obtained from an optical cryostat, showing how differential measurements (bottom) can be extracted from the two directly measured signals of the cryostat window and target (top). Kissinger, T. Charrett, S. W. James, A. Adams, A. Twin, and R. P. Tatam, “Characterisation of a cryostat using simultaneous, single-beam multiple-surface laser vibrometry”, AIP Conf. Proc. 1740, 100004 (2016). Kissinger, T. O.H. Charrett, and R. P. Tatam, “Range-resolved interferometric signal processing using sinusoidal optical frequency modulation”, Opt. Express 23(7), 9415-9431 (2015). Thomas Kissinger and Matthew Partridge from the Engineering Photonics group travelled to the Westminster Parliament on the 7th of March 2016 to present their science to an audience of parliamentarians and representatives of learned societies as part of the Set for Britain competition for early stage researchers organised by the UK Parliamentary and Scientific Committee. 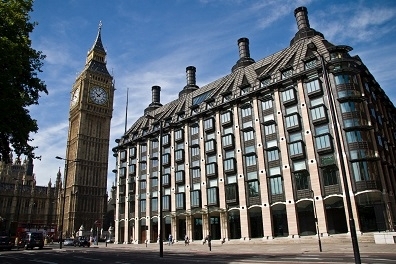 The poster presentation was held at Portcullis House, which is part of the UK Westminster Parliament Complex in London. Matthew took part in the Chemistry competition with a poster entitled “Fibre Optic Chemical Sensing”, while Thomas took part in the Engineering competition with a poster named “A Fresh Look at Optical Interferometry”. They were among the 60 presenters competing for each category. Although neither of them won a prize, it was interesting experience and a chance to update the Engineering Photonics poster collections with a new set of posters aimed at a general, non-scientific audience. In the true spirit of open science these posters are publicly available via our new Cranfield University Figshare account1,2. Partridge, “Fibre Optic Chemical Sensing”, (2016). Kissinger, “A Fresh Look at Optical Interferometry”, (2016). 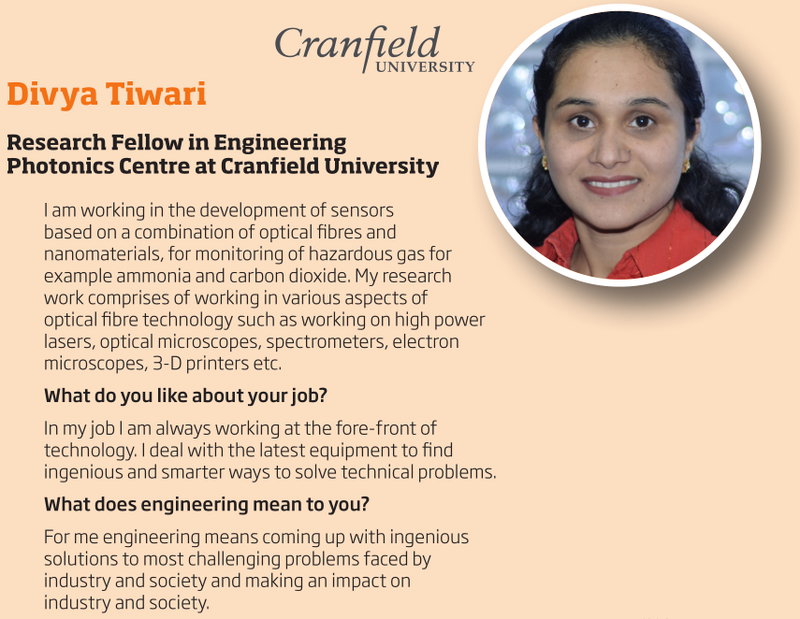 Dr Divya Tiwari of Engineering Photonics has been included in as a case study in 'Lights', a resource developed by Royal Academy of Engineering in the area of optics. The resource has several optics based experimental activities, including the investigation of polarization, refraction, and dispersion, and is aimed at Key Stage 3 (age 11-14) pupils and fits into the national curriculum. A recent paper, published in the IOP journal Measurement science and technology describes the application of infinity corrected lenses, commonly used for microscope objectives, for full-field interferometry applications such as optical flow measurement and speckle interferometry. The paper “Full-field interferometry using infinity corrected optics” describes critical considerations for constructing path-length imbalanced full-field interferometers using such lenses, including the concept of balancing the infinity-spaces of the two arms of the interferometer via the use of a glass block, convenient methods for phase shifting, and the introduction of carrier fringes in the interferograms. Or via CERES https://dspace.lib.cranfield.ac.uk/ (Cranfield University institutional repository). Quantitative shape measurement of small light bulb using the dual-wavelength technique. 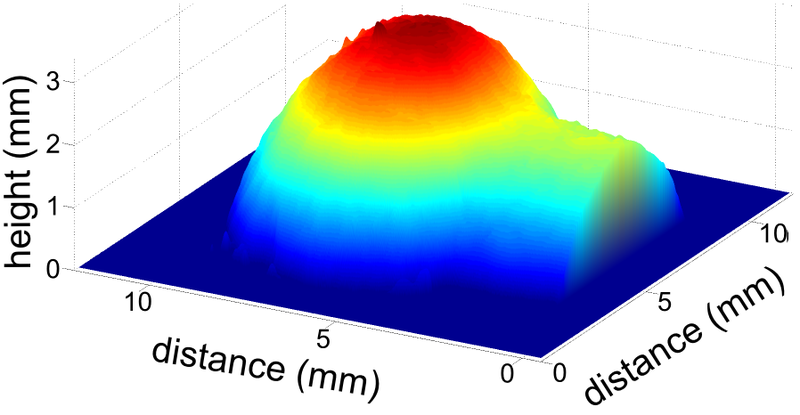 Our research on electronic speckle pattern interferometry (ESPI) was recently published in Measurement Science and Technology. Our interferometer uses a simple and compact optical arrangement which acquires a reference wave from a wedged window placed in the path of the illuminating beam. The design has come out of our work investigating the effects of laser speckle in diffusely reflecting gas cells. This offers an advantage over conventional ESPI interferometers which typically have widely separated beam paths and as such are subject to environmental fluctuations which disturb one beam path differently to the other, which leads to degradation of the desired fringes. Such interferometers are fine in laboratory conditions but impractical in field situations where vibration and thermal fluctuations are much higher. Compact ESPI using wedged window to acquire a reference wave. Our interferometer is based on a current and temperature stabilized laser diode, which allows temporal phase stepping to be performed on the diode itself through modulation of the control current and therefore requires no external moving parts. Further, a coarser frequency tuning can be achieved through modulation of the control temperature enabling shifting to adjacent longitudinal modes (mode hopping). This allows shape measurements to be made using the dual-wavelength technique. 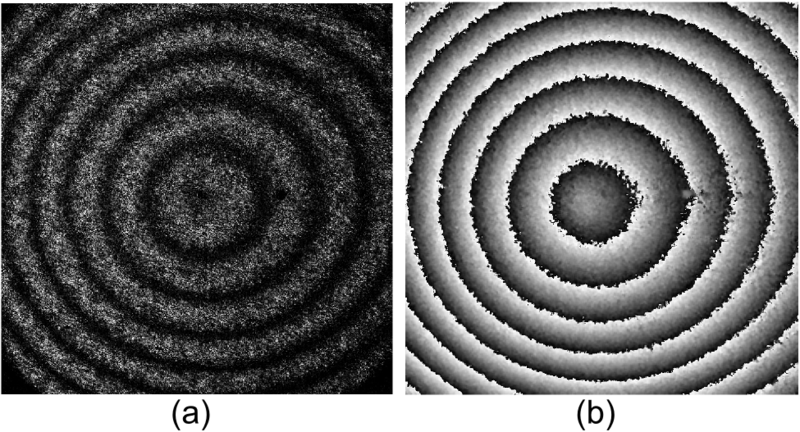 Correlation fringes (a) and wrapped phase fringes (b) obtained from a flat plate out-of-plane displacement using our speckle interferometer. Measurements were made using an aluminium flat plate into which an out-of-plane displacement could be induced and a small light bulb which demonstrated the interferometer's shape measurement capability. The paper was very successful and maintained a position in the journal's top ten most read articles for over a month and featured in MSTs highlights of 2015 article which can be seen here.